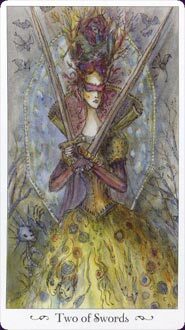 This is a striking image of a blindfolded lady with two swords. Crossed swords suggest a clash of ideas or words. The blindfolded lady, indicating impartiality, crosses her arms and so holds the swords apart. This is the knowledge of how to keep these two sides from fighting. It is very similar to a Mother who tells her bickering children: "I don't care who started it, go to your rooms!" Thus keeping the children apart and the house at peace. Each child wants mom to take his/her side, but she'd decided to stay neutral and keep them likewise, which means that her solution is temporary. The fight between them hasn't been resolved, it's just been put on hold. Sooner or later, this truce will end. This can indicate the qurent feeling like he/she is in the middle of something as a peacekeeper, or in a situation where tensions are running high and the lull in fighting isn't going to last. It's possible that the querent is trying to deny or ignore the fact that they didn't solve the problem and a reader would do well to remind them that they can't put off making a real decision for long. When we are faced with two opposing ideas or decisions with equally valid arguments, we do have a tendency to say, "I can't make up my mind right now, let me be!" But sooner or later, our minds have to go back online and we will have to decide what to do. Learn the Two of Swords tarot card meaning and the rest of the card meanings, symbols and stories in our eBook.